Progesterone is one of the hormones released from the ovary. It has an important role in maintaining pregnancy. The hormone is also important to regulate monthly menstrual cycle and in sexual desire. Endometrial hyperplasia: In absence of progesterone, the lining of the uterus that prepares for pregnancy, does not shed. This creates an abnormal condition called endometrial hyperplasia. It can lead to cancer. Secondary amenorrhea-The women stop menstruating for 3 to 4 month. The condition is in the absence of the following conditions. Progesterone is used to treat Amenorrhea, Endometrial Hyperplasia all above conditions. FDA approved it in 1998. How does the progesterone work? 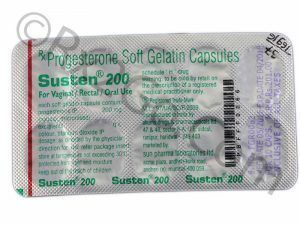 Progesterone belongs to the class of drugs called progestin (female hormones). Lack of this hormone creates a problem in the following functions. Of the body. Regulating condition of the endometrium (inner lining of the uterus). The drug replaces the natural hormone progesterone. Progesterone drug travels in the blood to the tissues where there are progesterone receptors. Here they attach to these receptors and produce its actions in the body. Thus it helps to correct the problems due to lack of natural progesterone. The Progesterone is available in form of a tablet of 100 mg and 200 mg.
Endometrial Hyperplasia. (In women after menopause with uterus receiving estrogen. )- 200 mg at bedtime for 12 days. Secondary amenorrhea- 400 mg for 10 days at bedtime. Children- use is not recommended. It is an oral drug to take by mouth. Better suggested to take at bedtime. Your doctor may make the changes in the dosage as needed. Continue to take progesterone as per prescription. What are the uses of progesterone tablets? Treats absence of menstruation (Amenorrhea). Progesterone is used in hormone replacement therapy. It prevents the thickening of the uterus lining. Thus decrease the risk of uterus cancer. Those who have to stop normal menstrual periods due to lack of progesterone. Decrease the amount of estrogen in the uterus. It plays an important role in the regulation of ovulation. Strengthen the wall of the pelvis for labor. Stimulate the breast in order to produce milk. Progesterone helps in the embryo implantation and pregnancy. So it is used along with fertility treatment in women. Prevents fertilization of more than one egg at a time. Prevents muscular contraction in the fallopian tube after the egg is transported. What are the precautions in taking progesterone? Age more than 65 years. It is safe to take in pregnancy or breast-feeding. Confirm with your Doctor. Brand drug includes charges like advertising, packaging Research and Development of the product. This increase the cost of the drug. Generic medicines does not spend much on pricing and packaging. There is no need to Research and develop the Generic drugs. This allows us to sell the cheap Generic drug. 30 capsules of 100 mg cost $ 29.99, per unit cost is $1. 100 capsules of 100 mg cost $ 359.09, per unit cost is $ 3.59. 100 capsules of 200 mg cost $ 674.44, per unit cost is $ 6.74.